Editor’s note: Dan Greenberg is the founder & CEO of Sharethrough, the native video advertising company. Dan has been honored as an AdAge “Media Maven” and was recently named to the Forbes “30 under 30″ list. You can find him on Twitter at @dgreenberg. Over the past ten years, publishers have continued to monetize their sites with banners and pre-roll ads, and advertisers have continued to pump billions into these formats, in spite of tanking performance and near- universal disdain. While click-through rates on display ads started out at around 9% in 2000, they now hover around 0.2% – which means 99.8% of banner ads are completely ignored. Meanwhile, led by YouTube and Hulu, the pre-roll ad market is only shifting in one direction: towards “skippable prerolls,” not forced interruption. And preroll skip rates are only moving in one direction (hint: when you give users the ability to skip annoying ads, they usually do). As banner clickthrough rates go down and preroll skip rates go up, a new opportunity has emerged for web publishers: native advertising. Native advertising is defined as ad strategies that allow brands to promote their content into the endemic experience of a site in a non-interruptive, integrated way. Most, if not all, major platforms on the web — Facebook, YouTube, Twitter, Tumblr, and WordPress — have universally adopted “native” advertising formats, in some cases entirely eschewing traditional display banners and interruptive preroll. For these new native ad platforms, borne of a generation of banner blindness and skip buttons, native is the only viable ad strategy. These native ad strategies are built around twin pillars of content and choice, not banners and interruption. Already, billions of dollars are being spent through Promoted Tweets on Twitter, Sponsored Stories on Facebook, Paid Discovery on StumbleUpon, Promoted Videos on WordPress blogs, and Tumblr Spotlight and Radar (just to name a few). This trend hints towards a native advertising market that’s already surpassed preroll video and is poised to overtake display advertising in the next few years. As the native advertising market explodes, the framework presented here aims to add a first layer of structure and definition to the emerging medium. Native advertising on “Closed” platforms is defined by brands creating profiles and/or content within a platform, then promoting that content through visually-integrated, content-driven, choice-based ads within the confines of that same closed platform. But it appears native advertising on closed platforms is just the tip of the iceberg. Over the past year, content publishers and independent technology companies, not just social platforms, have begun to introduce native ad experiences that reach beyond these closed platforms. For example, companies like Outbrain and Disqus power recommended content widgets on publisher sites like Mashable and USA Today, which enable marketers to promote their links through native ads. Companies like StumbleUpon and Devour help users discover great web content, and their advertising models are native to their user experiences: brands promote their videos, articles and websites into the same stream of discovery. In these cases, brands upload their content to a “closed” platform (often YouTube) then distribute that same content into these new “open” platforms with native ads. 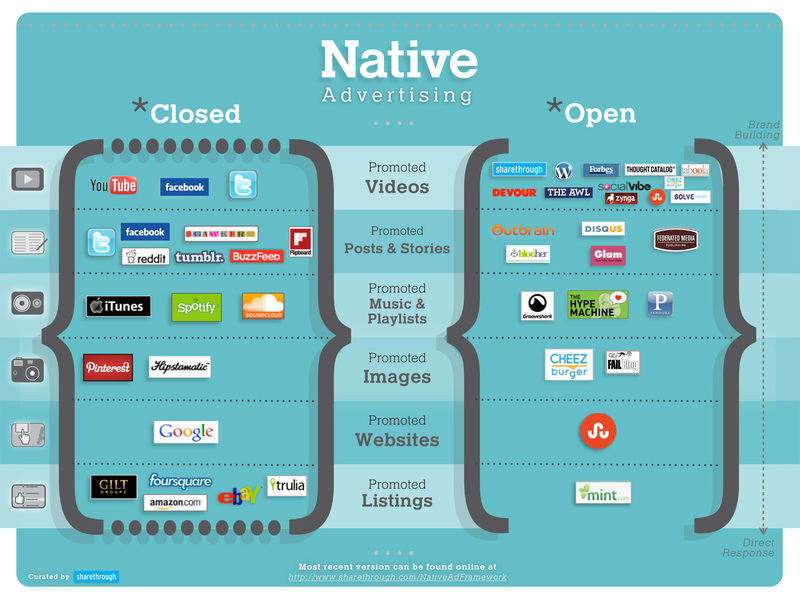 Native advertising on these “open” platforms is defined by the fact that brand content can live outside of the site, and can be distributed across multiple platforms through native ad formats. Just as the infamous Lumascape frameworks have helped define and evolve the mobile, video, and display ad ecosystems, having a unifying framework is an important step for the native advertising industry to evolve. To that end, introduced here is the industry’s first Native Advertising Framework – a first step in helping the industry understand and define the new native model. It’s very much a work in progress, but it’s a start. Please leave suggestions and additions in the comments. Video: Video is the most promising asset for scalable native advertising. Brands and agencies are doubling down on video production, beyond traditional 15-30 second ads. WPP’s (the largest ad agency holding company in the world) recent investment in Vice and commitment brand content production and native video advertising pours yet more fuel on the fire of branded video content. Standards and metrics: A new category of advertising requires new pricing models and new metrics for success. The IAB has not yet set standards for native ad formats, but with the pressure of billions of dollars of shifting ad spend, they’ll most likely chime in. Keep an eye on this conversation. Scale: Scalable buying platforms will accelerate the shift in advertisers’ ability buy native ads across multiple platforms, starting first with “social DSP’s” built on top of Facebook, then Twitter, StumbleUpon, Linkedin, Zynga, and beyond. Product innovation: Breakthroughs in design and interactive features will bring native advertising to new levels. Facebook’s new in-feed “offers,” Sharethrough’s native promoted videos, and LinkedIn’s personalized recruiting ads all hint at the future for native ad placements. Closed platform adoption: Keep an eye out for platforms like Pinterest launching Promoted Pins, Google Plus launching promoted discovery ads, and Instagram/Facebook mobile to introduce new native ad strategies to the market. Open platform adoption: As open platforms like WordPress, Forbes, New York Times, and beyond begin to adopt native advertising, it will create further opportunity for marketers to distribute brand content at scale.